I recently attended a silent retreat. Yes, I said silent. 6 hours of not conversing with anyone. Well, no human. God only conversations. First question is how in the world can an extrovert keep silent for 6 hours? Well, I can, and I absolutely loved this quiet time with God. I often ask myself, “Why can’t you just make quiet time whenever you want?” Well the answer is I can, but I don’t. In preparing for this retreat, I asked God to direct me and give me insights on how to get ready. In my prayers, I heard Him say, read the book of Jeremiah, mark it in your Bible so you will be ready. And so I did as I was instructed. As I began my silent time at the retreat, I opened my Bible, and to my surprise I had marked the book of Nehemiah. What? This must be a mistake? “No.” I heard loud and clear. “Just do it.” I began reading. Who was Nehemiah? Nehemiah was a high official in the Persian court of King Artaxerxes I at the capital city of Susa, which lays 150 miles east of the Tigris River (in what is now modern Iran). Nehemiah served as the king’s cupbearer (Nehemiah 1:11), which evidently put him in a position to speak to the king and request favors from him. What does this have to do with me? The message was clear: You are a leader. Learn from Nehemiah. 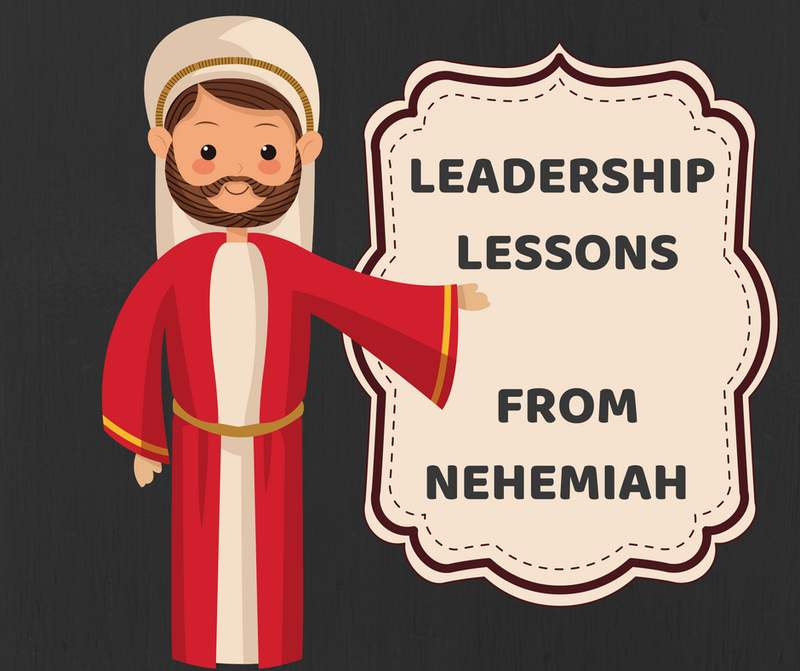 Now for the leadership lessons that Nehemiah is going to teach me. This was written for me. This is better than any leadership development course you have taken. Being a great leader is not easy. Learn from me. Heed my words. Let’s begin . . .
Go back to the basics – Use knowledge, determination, and organization to determine what needs to be done. Nehemiah tells me, you do not need more than these to lead others. First pray, then move. I am guilty of doing these things in reverse. I move then pray. Don’t hesitate to ask God for success. I am usually humble and say, “If you don’t mind . . . or if you could.” The lesson is asking for success, not just part of it but all of it. Don’t allow fear to be more powerful than God. Realize the fear that is holding you back. Look it in the eye and tell it your God is bigger and more powerful. If God has called you to a task, He will equip you to do it. This is scary. I am a testimony to the truth of this statement. I always think I am getting in over my head and then I am reminded. God told me once that He wanted the Motherless Daughters Ministry to be known all over the world and to become a nonprofit. I cringed with fear. Today it is a nonprofit and it is known all over the world. Praise God! Sometimes when we have needs, we hesitate to approach the right person. Don’t hesitate, they may be more interested and helpful then you think. Acknowledge God as your power source. That part is easy. Oh, and the lessons about obstacles ring true for me. When you attempt to do God’s work, some will oppose you. Some will hope you fail. Expect opposition. I have experienced this and it sure isn’t pleasant. I just cannot understand others’ motivation. Every group will have those who think they are too wise or too important to serve. Ignore them. I have experienced this too. Somehow, they think they always have more knowledge, more experience, more of everything. They often just want to tell you what you do not know. It is really what they do not know. Sad. There will be those who try to scare you away with scorn, threats, and bluffs. Ignore them too. I have heard, “If you do this . . . then I will . . .” And then there was one who threatened to withdraw her financial support of the ministry. She did, and God sent someone else to fill the gap. Ridicule can cut deeply, causing discouragement and despair. Refuse to respond in the same way. Oh, this is hard. I cannot say anything to anybody. I have to take the high road while they can say anything they want to about me. It just doesn’t seem fair, but that is what I must do. Leaders are often targets of attack. Tell me about it. Sometimes I feel 3 feet tall because I have been beaten down so much. I recently felt this way and posted on FB that I needed a hug today and out of nowhere someone sent a BIG hug to me. I was touched. Don’t let the size of task or length of time needed to accomplish the task deter you. Obstacles and foes can make us give up. If they accomplish the latter, they have won. The task God has laid on me is HUGE. Leading the Motherless Daughters Ministry is a blessing. I have been working at this for 18 years and God tells me I am not done yet. Plan ahead and check your ideas. I am a planner. This piece is easy-peasy for me. And I make it a habit of checking my ideas with others. Sometimes I am brilliant. Sometimes I am stupid. Renewal often begins with one person’s vision. As we enter our 18th year of serving women, we are working hard to bring about renewal and rebuild how we serve women who are motherless. Share your vision with us. How can be best serve you? Challenge people with your dreams. I have challenged others with my dreams and sometimes they join me and other times they fall into the #2, #3, and #4 in the obstacles category. Find a place to serve God, then start contributing. I need you. I need your help. Please help me to serve the women in this ministry! We need leaders, facilitators, thinkers, and doers. Just let me know and we will make it happen! Communication relieves fear. Good leaders keep us in touch with the work to be done. I think I do this, but when I hear what others do not know, I am reminded of the great need for my improvement in this area. Often when we celebrate and give to others, we are strengthened spiritually and filled with joy. Yes! My heart sings when others are successful! Accomplishing any large task can be tiring. The only cure for fatigue and disappointment is focusing on God’s purpose. I am truly exhausted. I need others. I absolutely need to focus on God’s purpose. We must do something with what we have learned if it is to have real significance. This hits home with me. God has revealed that He wants me to write. Not just anything, but He wants me to write about all I have learned working with women over the last 18 years. He has put books and titles on my heart. I am beginning this process, but my fear is HUGE. Please pray for me as I begin this journey. It is helpful to remember our beginnings in order to appreciate where we are today. Think back and see where God has led you. Thank Him for continuing to protect you and provide for you. Yes Lord, I ask for your protection and guidance as I do your Kingdom work. Honest confession precedes worship. It is this order of confession before worship that I must remember. Remembering personal history helps us to understand how to improve. Learn from the past. My history has shaped who I am. I am a work in progress. Someday I might be all put together, but right now, I am sewing a piece at a time to my mosaic of life. Continue relying on God for help. Yes! I am overwhelmed processing all of these. I guess I was supposed to study Nehemiah after all.